For most of us, outside of perhaps buying a home, a car is our biggest purchase. Whether you have purchased a car or truck, there is a good chance the much research was done prior to even walking into the dealership. You asked your friends and neighbors. You looked at trusted information from sources like Car & Driver or Consumer Reports. Perhaps you even took the time to review your credit report to make sure you could get the best financing rate available. So much time was devoted to the purchase of your vehicle, you probably even had the make, model and color picked out before entering the showroom. Finally, you made your purchase and drove your new or used car off the dealership lot. Now what? did you take the time to research and find a mechanic to service and repair your vehicle when something inevitably goes wrong? The expert mechanics at Santa Rosa Transmission are the area's top choice for general service, repair, and maintenance. Avoid costly repair bills by having the small maintenance jobs done to keep your car performing optimally and extend the life of your vehicle. All factory service intervals are handled in a professional manner by consulting your owner’s manual for proper maintenance. For the best in general auto maintenance and repair please call us at 707-766-0750 or click here to schedule an appointment. 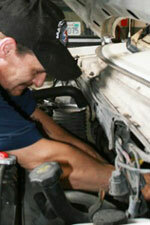 At Santa Rosa Transmission & Car Care, our team has been serving the Santa Rosa area for nearly twenty years. We pride ourselves on being courteous, professional, and knowledgeable about all makes and models. We will take as much time as needed to explain what is wrong with your car or truck, and more importantly what could go wrong in the future. Whether you need factory recommended maintenance or repairs in Santa Rosa, make us your first call.